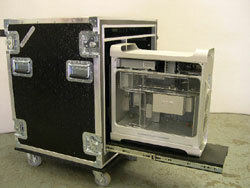 Case” ($1,625) and road-ready cases for the Apple Cinema 20″ display ($525). Cheap? No, but neither is the rest of a serious touring rig, and note that customers include Sting and CBS Studios. (Not sure Sting bought this case specifically; they do all manner of custom cases. And yes, they’re based in Nashville, or at least nearby Brentwood.) Thanks, Mike!